An obvious reason for interest in electric water heater thermostats is the temperature of your hot water. If you need to adjust the water temperature, the thermostat is the place to do it. Most of the time, the thermostats get some interest when you have too little hot water or no hot water. The thermostats could be part or all of the problem. Not sure if the thermostats are the issue? See the article on 'Electric Water Heater Troubleshooting' for descriptions of all the common problems and a listing for resources on how to fix them. The thermostats are closely related to the 'heating elements' and testing and checking should inolve both components. An electric water heater thermostat tells the heating elements when to heat up. Most electric hot water tanks have two elements and two thermostats. The elements do not heat up at the same time. The top element heats the water first and then the bottom element kicks in. The upper thermostat acts as a coordinator between the two elements. When the water in the top part to the tank is hot enough, it lets the lower thermostat go into action. When the lower thermostat senses the water is too cool it turns on the lower element. This happens only after the upper element has finished heating. You need to do some testing to determine which element or thermostat is bad. There is another reason you could be here. To adjust the temperature of the water you need to get to the thermostats. These thermostats are a little harder to adjust than your furnace is. There are a couple of things you need to do to expose them. Replacing an electric water heater thermostat is not that hard of a job. 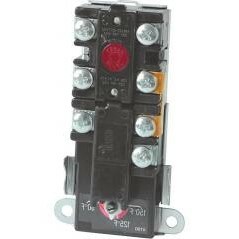 You are dealing with some serious electricity and that adds a safety factor. Try the reset buttons before you replace the thermostats. Each thermostat has one. Do not work on the wiring for an electric hot water heater with the power on. 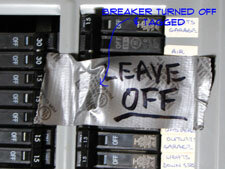 Make sure the breaker is shut off and taped or locked in the off position. The current in a hot water tank can kill you. Replacing the wrong thermostat may still leave you without hot water or not enough hot water. Before you test or work on electric water heater thermostats or the water heater in general, you want to make sure that you have shut off the power to the water heater. The electrical power that heats the water can cause serious injury or even death. See the article, 'Shutting Down an Electric Water Heater' and 'Electrical Safety Tips' for more infomation and the proper procedures to follow when working on an electric water heater. WARNING!! Make Sure the Power is OFF!!! BEFORE You Work on Water Heater Thermostats!!! Is it safe to work on electric water heaters? It is not safe to work on an electric water heater without taking certain precautions. Before you do anything, you should shut down the power to the heater. See the article 'Shutting Down an Electric Water Heater', and review the section on safely 'Shutting Off the Power'. Water heater thermostats are connected directly to the hot water tank. The tank will likely be hot. See the section on 'Cooling Down a Hot Water Tank' in the article 'Shutting Down an Electric Water Heater' for information on lowering the water temperature in the tank. The electric water heater thermostats have a dial on them that you use to adjust the water temperature. The article on 'How To Adjust a Water Heater Thermostat', discusses this topic in detail. Do Not raise the water temperature to generate more hot water. The factory settings will at a safe level. Raising the temperature can cause burns and scalds and should only be done using extreme caution. If you have too little hot water, the temperature setting is not the problem. The thermostats themselves could be causing the trouble. See 'How To Test Electric Water Heater Thermostats' for more information. It could also be a bad heating element, see 'Electric Water Heater Element Testing' to learn how to check the elements. Not sure what you problem might be? See the article, 'How To Troubleshoot Electric Water Heaters'. How do I test a thermostat to see if it is working correctly? You want to see the article on 'How To Test Electric Water Heater Thermostats' for information and the correct testing procedure. How do I replace an electric water heater thermostat? To replace a thermostat, you will need to remove the old one. The article 'Installing a Water Heater Thermostat' Will provide you with instructions on removing the old one and installing the new one. Where can I purchase a new water heater thermostat? How much do they cost? Another challenge you will face is obtaining a new thermostat. The section on 'Purchasing a Water Heater Thermostat' in the article 'Installing a Water Heater Thermostat' will you some guidelines on how to obtain one. How do I find out if my water heater elements are bad? Another closely part is the heating elements. If the thermostats are working properly and you still don't have hot water, one or both of the elements could be bad. See the article on 'Electric Water Heater Element Testing' for information and procedures to follow. There are basically two reasons for being concerned with an electric water heater thermostat. The first and easiest is to adjust the temperature. Unless you have some unusual circumstances this is not needed most of the time. The other more common problem is that one or both of the thermostats is malfunctioning. Hopefully this informatin pointed you in the right direction for a solution.